You will be given a reference e-book to read which has 777 pages And the test will be based on that e-book , you can take final test within 1 year of purchase. What is Purchasing and Supply Chain Management? Purchasing and supply chain management is one of the most complex areas when running a supply chain. You can expect this process to involve the managing of a network containing interconnected business organizations that are more concerned about providing product and service packages that are needed by supply chain customers. It also encompasses all types of storage and movements for raw materials, finished goods right from their point source up to their consumption. It can also be defined as the process of designing, planning, executing, controlling and monitoring the activities of supply chains including purchasing with an aim of establishing net value, building a more effective and competitive infrastructure, synchronizing supply and demand, globally measuring performance and leveraging logistics that work worldwide. The good thing about running the purchasing and supply chain management process is that it is capable of addressing numerous problems that are usually encountered by a supply chain. Among these problems are those that affect distribution network configuration components including network and location missions of various suppliers, warehouses, customers, cross-docks, distribution centers, numbers and production facilities. It also resolves problems that continue to have a negative impact on distribution strategy, trade-offs associated to logistical activities, inventory management, purchasing activities, information and cash flow. By resolving all these, it would be easier for your supply chain to operate just as what you have desired. If you really have a strong desire to completely understand everything about purchasing and supply chain management, then the purchasing and supply chain management certification program which is now introduced by Brainmeasures to a wide range of individuals and professionals can definitely help you out. This purchasing and supply chain management course is perfect for you because it was developed by keeping in mind the need to continuously inform people about the field. With the purchasing and supply chain management training which comes along with this online certification program, you will easily understand everything about a supply chain, how it works, how you can manage its different activities including those that are related to purchasing, the different techniques that you can use to keep your supply chain working and the most effective ways to handle the purchasing and supply chain management process. Finishing up this certification course entitles you to receive a purchasing and supply chain management certificate which will serve as your ticket towards proving your competence in this popular field. How the purchasing and supply chain management process evolved? 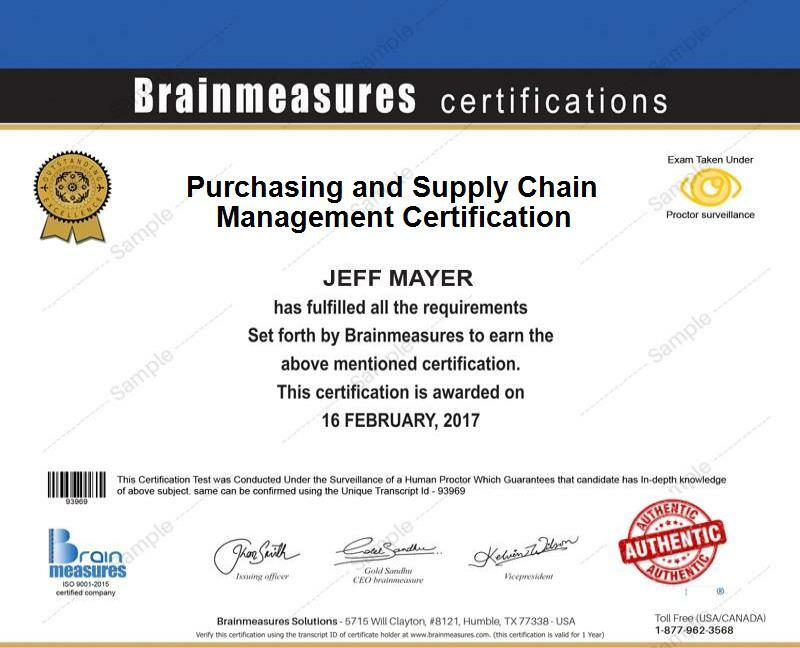 The purchasing and supply chain management certification program which is now available at Brainmeasures covers a variety of topics that, when fully understood, can help different professionals provide great contributions in improving the performance of a business organization. This program actually targets supply chain managers, supply chain directors, supply chain executives and all other individuals and professionals who are more concerned about ensuring that the management of purchasing and supply chain activities is properly implemented. Your purchasing and supply chain management certification can also serve as your ticket towards receiving an even bigger salary. With the presence of your certificate, it would be easier for you to grab the position of a purchasing and supply chain manager and receive approximately $68,000 to $124,000 annually. Being a purchasing and supply chain management also entitles you to enjoy an annual salary within the usual range of $72,000 to $141,000.